New Jersey Sen. Bob Menendez in June. A new poll found that the Democrat is leading Republican Bob Hugin by 9 percentage points among likely voters. A Democratic senator who survived a federal bribery trial. Two Republican congressmen currently under federal indictment, one for alleged campaign-finance violations, the other accused of insider trading. In addition to carrying ethical baggage, the candidates have something else in common: They're leading in the polls in their reelection campaigns. There’s still no evidence Menendez slept with underage prostitutes. New attack ad says it anyway. At a time when surveys show that support or opposition to President Trump is a top factor in voters' electoral calculus, many voters in states or districts that are traditionally noncompetitive appear willing to overlook ethical shortcomings to send a bigger message in next month's midterm elections. "It's so hyperpartisan right now, divided along lines where Trump is the main factor, that almost anything else that happens doesn't really matter," said Patrick Murray, director of the Monmouth University Polling Institute. 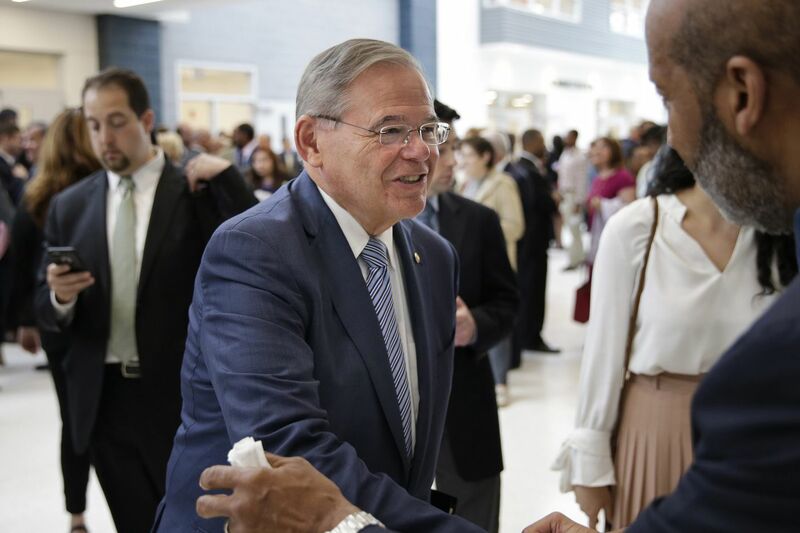 The latest sign: A Monmouth poll released Thursday shows Sen. Bob Menendez (D., N.J.) leading Republican Bob Hugin by 9 percentage points among likely voters. The state's senior senator is hardly popular — just 28 percent view him favorably, compared with 45 percent who view him unfavorably. But in casting their Senate vote, a majority of voters say their view of Trump is more important than their view of Menendez, whose bribery trial ended in a hung jury last year. Prosecutors later dropped the charges, but the Senate Ethics Committee "severely admonished" Menendez for his conduct. That might not matter in a state that hasn't elected a Republican to the Senate in 46 years, and where 55 percent of likely voters disapprove of the president's job performance. What's more, Monmouth found, 64 percent said they felt that "whatever Menendez did" was "about the same as what most other politicians do." The story is similar in California's reliably Republican 50th District, where indicted Republican Rep. Duncan Hunter is leading Democrat Ammar Campa-Najjar in the polls. Trump carried the district by 15 points in 2016. California Rep. Duncan Hunter leaves San Diego federal court on Sept. 24, 2018, after he and his wife, Margaret Hunter, appeared for a status hearing. They are charged with misspending political donations on personal items. Hunter is leading in the polls. Prosecutors in August accused Hunter and his wife of using campaign funds to pay for luxury vacations and other personal expenses. They have pleaded not guilty. Just a slight plurality of voters (35 percent) view him favorably, according to a September Monmouth poll, suggesting he could be vulnerable. But 52 percent of voters in the district approve of Trump, and 64 percent of potential voters identified by Monmouth say it is "very important" for them to "cast a vote for Congress that" reflects their views of Trump. Monmouth found that Hunter had a 15-point lead among likely voters, although other polls show a tighter race. Indeed, 1 in 10 voters in the Monmouth survey believe Hunter is or could be guilty but plan to vote for him anyway. Then there's New York Rep. Chris Collins, a Republican indicted in August on insider-trading charges. Collins briefly suspended his campaign but pleaded not guilty and decided to stay on the ballot. A near-majority of voters (49 percent) view him unfavorably, according to an Oct. 16 Siena College poll. But in a district where Trump enjoys strong approval ratings (56 to 38 percent), Collins is still leading Democrat Nate McMurray by three points, the survey found. "Will voters show their loyalty to the president and their party inclinations by reelecting Collins?" Siena College pollster Steven Greenberg asked this week. "Or will they spurn the indicted pol and vote for Democrat McMurray despite their yearning for the House to remain in Republican control?" In this July 19, 2016, file photo, Rep. Chris Collins (R., N.Y.) looks over the lectern during a sound check before the second day of the Republican National Convention in Cleveland. Collins is being challenged for his seat by Democrat Nate McMurray in New York’s most conservative congressional district, which is unexpectedly in play as Collins fights insider trading charges while seeking reelection. These candidates almost certainly would face tougher prospects in swing districts or states. But even in blue New Jersey, a letter of "severe admonishment" handed down by the Senate Ethics Committee was enough to end Democratic Sen. Robert Torricelli's 2002 reelection campaign. He dropped out of a tight race. Of course, Trump has encouraged his supporters to view the charges against Republicans with suspicion, and critics have ripped the president for attempting to politicize the Justice Department. When a prankster pretending to be Menendez somehow got Trump on the phone in June, the president reportedly congratulated the senator for beating the bribery charges.